As I was leaving the library one day, I spotted an SUV called the Isuzu Axiom. Apparently it’s been around for a while, but this was the first time I’d seen one. Anyway, it had such a mathematical name – “axiom” – that I knew there had to be a joke somewhere. Well, this is what I came up with. Enjoy! 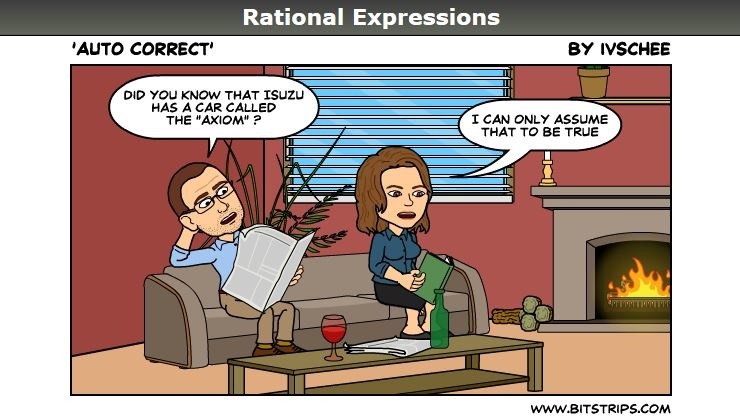 Posted on April 28, 2014, in Rational Expressions - A Comic Strip. Bookmark the permalink. 1 Comment. I want for someone named Joyce to buy a yellow Isuzu Axiom and put the license plate “ZORN” on it. Because Zorn’s lemon is equivalent to the Axiom of Joyce.